War hero during the Korean War, where he rescued forty comrades from behind enemy lines for which he was awarded the Bronze Star. 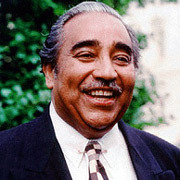 Democrat and liberal, Rangel was elected to the New York State Assembly 1966-70. Since then he has been serving continuously as U.S. Representative from New York's Harlem district. Rangel is the senior member of New York's Congressional delegation, and chaired the powerful House Ways and Means Committee until stepping down from that post in 2010, amidst reports of his unethical trips, assets and income, use of rent-controlled apartments, and his solicitation of donations for a university center to be named after him. Re-elected to a 20th term in Congress by a landslide in 2010, and found guilty of 11 violations by a House ethics panel two weeks later. As punishment, he may face "admonishment".